Prominent & Leading Exporter from Navi Mumbai, we offer proguanil atovaquone tablets, quinine sulphate tablets, anti malarial tablets, artesunate injection, dihydroartemisinin tablet and artesunate combikit. 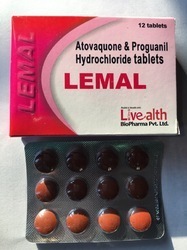 Proguanil Atovaquone Tablets is used to prevent and treat malaria caused by mosquito bites in countries where malaria is common. Malaria parasites can enter the body through these mosquito bites, and then live in body tissues such as red blood cells or the liver. Prevent night cramps in adults and the elderly when sleep is regularly disrupted. 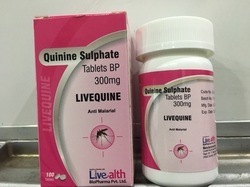 Livequin Quinine sulphate belongs to a group of medicines called antiprotozoal agents. And prevent night cramps in adults and the elderly when sleep is regularly disrupted. Some antimalarial agents, particularly chloroquine and hydroxychloroquine, are also used in the treatment of rheumatoid arthritis and lupus-associated arthritis. Packaging Details: 250 Tablet In a plastic jar in a printed carton. Artesunate is developed for killing the erythrocytic stage of plasmodium asexual form. It is effective to malaria caused by chloroquine resistant stain of plasmodium falciparum. It can quickly and reliably control the acute attack of malaria. It is suitable to salvage the patients with pernicious malaria and treat P. falciparum malaria and P. vivax malaria. 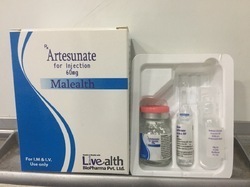 Artesunate Injection is indicated for the treatment of serious malaria infections and the patients with cerebral malaria. Packaging Details: 60mg injection with 1ml Ampoule sodium bicarbonate Inj. & 5ml Sodium chloride Inj. 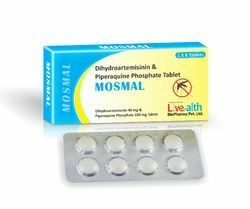 Dihydroartemisinin is a drug used to treat malaria, and its active ingredient added to piperaquine is used as a prophylaxis, and for the treatment and prevention of malaria. They are manufactured and used as tablets for treatment of malaria in individuals with suspected or confirmed infection, and for prevention of infection in individuals, with no immunity to malaria, visiting a malaria-endemic region. Malealth - Kit is based on WHO recommended ACT-kit. Uncomplicated malaria is defined as symptomatic malaria without signs of severity or evidence of vital organ dysfunction. To counter the threat of resistance of P.falciparum to monotherapies, & to improve treatment outcome, combination of anti-malarials are now recommended by WHO for the treatment of falciparum malaria. NVBDCP recommends this combination as the ACT of choice for treating P.falciparum malaria all across India. Packaging Details: Single Kit containing 4 tablets in a printed carton. 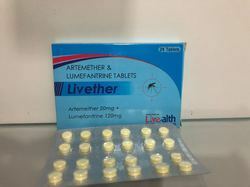 The combination of artemether and lumefantrine is associated with a high cure rate andwas more effective then most other drug combinations used to treat uncomplicated malaria. Malaria is a parasite disease which is spread by mosquitoes. It has affected millions of peopleworldwide, and causes significant illness and deaths. 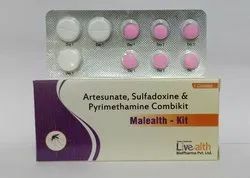 Artesunate suppositories are used for the treatment of malaria. Artesunate is an antimalarial water-soluble derivative of dihydroartemisinin. 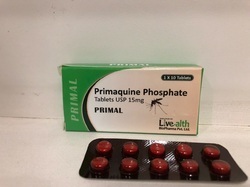 Primaquine phosphate is an antimalarial prescription medicine approved by the U.S. Food and Drug Administration (FDA) for preventing a relapse of vivax malaria—a type of malaria caused by the parasite Plasmodium vivax (P. vivax). Malaria is an opportunistic infection (OI) of HIVPrimaquine is primarily used to prevent relapse of malaria due to Plasmodium vivax and Plasmodium ovale. It eliminates hypnozoites, the dormant liver form of the parasite, after the organisms have been cleared from the bloodstream. 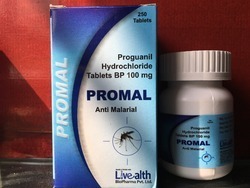 Proguanil Tablets 100mg is an effective antimalarial agent. 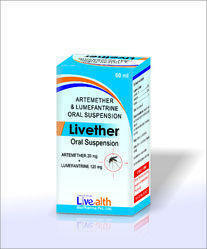 It is recommended for the prevention and suppression of malaria. Standard tablet of Malarone contains 100 mg of proguanil hydrochloride and 250 mg of atovaquone. A pediatric tablet contains 25 mg of proguanil hydrochloride. we are best in proffering Atovaquone Tablets. They are effective and use for the treatment of malaria. Also known as Lemal. Chloroquine Phosphate, USP, is a 4-aminoquinoline compound for oral administration. It is a white, odorless, bitter tasting, crystalline substance, freely soluble in water. 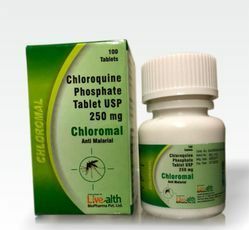 Chloroquine Phosphate Tablets are an antimalarial and amebicidal drug. 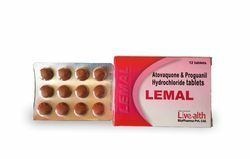 Atovaquone and Proguanil Tablets is combination of the antimalarial agents atovaquone and proguanil hydrochloride. 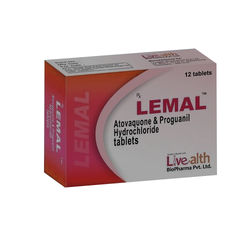 We hold immense expertise in catering to the variegated nutritional requirements of the customers by bringing forth a precisely formulated range of Antimalarial drug.This medication contains 2 medicines: atovaquone and proguanil. It is used to prevent and treat malaria caused by mosquito bites in countries where malaria is common. Malaria parasites can enter the body through these mosquito bites, and then live in body tissues such as red blood cells or the liver. This medication is used to kill the malaria parasites living inside red blood cells and other tissues. In some cases, you may need to take a different medication (such as primaquine) to complete your treatment. Both medications may be needed for a complete cure and to prevent the return of infection (relapse). Atovaquone/proguanil belongs to a class of drugs known as antimalarial. Its a Generic Malarone. Quinine Dihydrochloride Inj 300 Mg/ml For the treatment of acute attacks of malaria, including attacks due to chloroquine resistant or multi drug resistant strains of Plasmodium falciparum. Quinine is used parenterally for cerebral, severe or complicated malaria, or when vomiting prevents retention of an orally administered drug.Quinine dihydrochloride is the salt usually employed for the preparation of injections.Quinine acts primarily as a schizonticide i.e. it suppresses the asexual cycle of development of malaria parasites in the erythrocytes. It has little effect on sporozoites or pre erythrocytic forms of malarial parasites. It does not, therefore, prevent the relapse of Plasmodium vivax infections. Quinine is also gametocidal for P. vivax and P. malariae but not for Plasmodium falciparum, and therefore does not prevent transmission of this infection by the mosquito. Plasma concentrations of quinine between 8 and 15 mg/litre are effective clinically and are generally non-toxic; such values are usually achieved with the standard therapeutic dose. Approximately 70% of quinine is bound to proteins in the plasma in healthy subjects, rising to about 90% in patients with malaria. 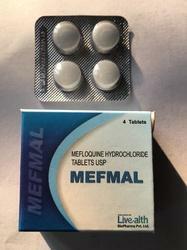 Used to Treat: Malaria and prevent night cramps in adults and the elderly when sleep is regularly disrupted. Looking for “Anti Malaria Medicine”?